This wolf in sheep's clothing saying can take on a new meaning with this ghillie garment. Lets just be happy that we are on the side of the wolf. This is one of America's finest Marines from the 2nd Recon Division providing surveillance in an Afghanistan hot zone near the Helmand River which can be a major crossing points for combatants. These camouflage veils can be great to conceal your melon, back pack, or other equipment. 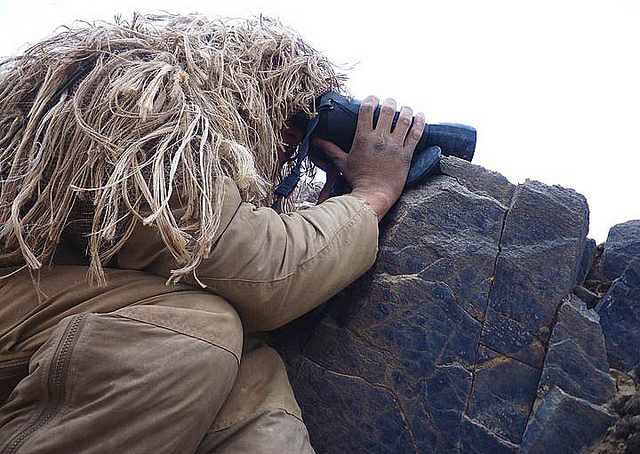 They are typically made with Jute thread attached to webbing and available in multiple colors and camouflage patterns. This is an arid or desert version of a ghillie veil.